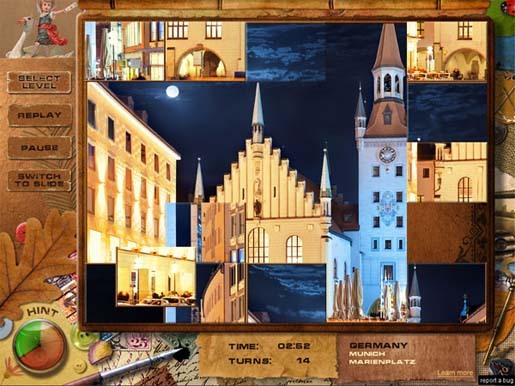 You can have an eternal entertainment for hours with Adore Puzzle. If you start playing this game, it is sure that you will be addicted. It has come out with a collection of wonderful photo collections of different European places to bring you the fascination feel of a real tour right from your desktop. Your game place will begin from England and continue towards the East as the game progresses. While playing the game, you’ll be represented by a particular country on the game map. Once you finish the level, you’ll see the next level to solve. After that, you can see the Puzzle and Slide modes that you can switch from each other. Using the Help menu of the software, you can view the picture for a short period of time.